Landing pages have a significant influence on your business, especially online marketing. This is because they help you deliver the right information about your business to the target audience. Also, for that, you will get a good return on your money, and time. If you are still sending your web traffic to your home page, it’s time you stopped it because there’s something better, with better conversion results; it’s called a landing page. Landing pages convert the web traffic into quality leads. If you are running a business online; advertisements on Google or Facebook, you need to know the pages to create, and how to create them. Also, you have to be strategic if you are going to convert much of your leads into sales, and have some income increase. This guide will help you with essential tips and strategies on how to create landing pages. You may have asked yourself; what is landing pages and probably “what are landing pages used for?” Here is a definition of landing pages: it is a single page that comes into sight when you click on a search engine optimized search results. They work systematically to convert traffic into leads, leads into customers, and customers into raving fans. Whether your web traffic comes from a Facebook ad, blogs, or emails, whenever people visit your landing pages you need to ensure that they meet insightful information to convince them to click and convert. Select a list using the drop-down menu. All contacts that will visit your landing page will be added to this list. You need to drag content blocks into your layout and customize your landing page content. From there, you can publish your landing page when ready. Well, first a web page is for your website. Websites are great for general information about you, your company, your details, and services. A single web page will won’t give all the information about your website, and that’s where a landing page comes in handy. A landing page a short page with clear information about the product you are selling, and a call to some action. Think of a landing page as a lone ranger that welcomes the traffic, makes them feel at home, tell them about your product or service, convince them that their needs will be fulfilled when they use the product, and convinces them to make a purchase. If it’s a custom landing page, it’ll even show them some testimonials on how helpful your product is to your fans. That’s not all; a landing page does this in one page which can be scaled in just a few seconds. Isn’t that what you’ll want when searching for a product on the internet? 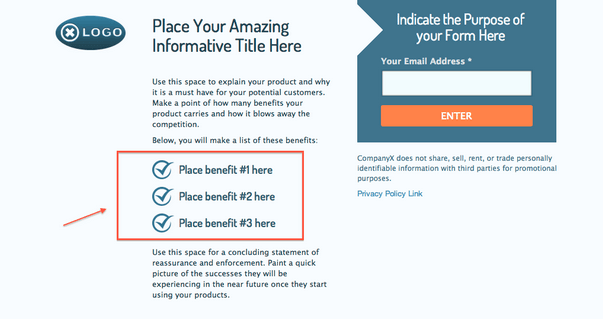 Landing pages have three primary goals. These are; to invite traffic to your website, to collect information about the traffic and or to convert your leads into customers. Your landing page conversion rate is the percentage of traffic that’s translated into customers by clicking on the purchase button, or the call to action button on your website. So that’s it; a landing page should have a call to action so that when the visitors are done reading all the carefully crafted information on it and are convinced of your services, they should click on the link, and thereby the page shall have served its purpose. Landing pages are designed to generate leads and more so to nurture your audience throughout their journey as customers. Conversion in most landing pages occurs if they use a clear and compelling call to action. As an online marketer, you may be asking yourself “why landing pages?” There are many reasons as to why you should. The leading causes are that landing pages are more effective and efficient compared to web pages. Landing pages have great traffic whereas a webpage is limited. Therefore, your online market will grow when you use landing pages. Landing pages are essential in the competitive digital landscape. If you are running an online marketing campaign, websites are just not enough. So, you should create a landing page to complement your site. With landing pages, you will attract the correct audience for your web page and make it easy for you to engage them, and bring the audience to a defined call to action. Local content landing pages help your site rank higher. Therefore, you’re marketing will grow since you’ll have many local visitors. Data tracking is possible with landing pages you’ll be able to know how engaged your prospects are. A landing page can be used at any point of your marketing campaign as long as you have an objective for it, and when you know how to use landing pages appropriately. Generally, they are used as sales funnels or call to action pages that convert potential customers into customers. So landing pages are most appropriate when you need to turn traffic into customers. Generate traffic leads; best landing page examples for this are those used to sign up for your mailing list. At this point, we have addressed the question; what are landing pages? The next thing you need to know are the different types of web site landing pages. Each type has their specific uses and strengths. They are; splash pages, sales pages, and sales pages. Squeeze pages are also known as lead capture pages. They are the most common types of landing pages of the three. As the names hint, these pages squeeze out the most information you can out of the page visitors. By the time they leave the site they should have gone their names and email addresses among other basic info. This type of landing page primarily direct traffic into your website’s homepage. With these, when creating landing pages ensure that you put much emphasis on the welcoming notes. The main aim here is the welcome gate with a call to action which saunters the readers into the website homepage. Close sale landing pages just as their name suggest, our call to action landing pages which lure the visitors into making sales. 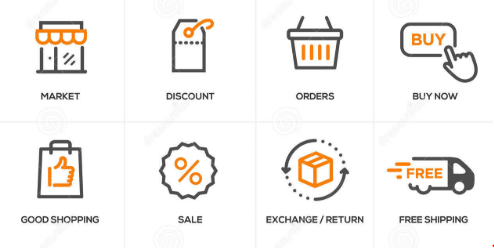 While the first two types are aimed at getting visitor information and directing traffic to the main page of your website, this one calls upon the visitor to make a purchase, immediately. While there are different and unique types of landing pages, they are made based on the same basic concept. 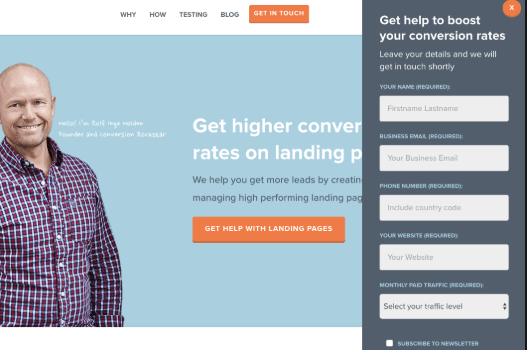 In this section, we’ve put together some best practices on how to create landing pages so that you come up with optimized landing pages. A landing page should be created with a specific objective in mind. This will keep you focused on that particular objective so that you steer clear of any sideshows. Generally, the objective here to ensure that you walk your website visitors through a journey; from traffic to an acquaintance to a customer. There should be some chronological flow of ideas. Welcome the visitor, mention what’s unique about your product, convince them on how their needs will be fulfilled by using your product and then convert them into customers. Not just through words but through the landing page web design too. The end goal for most marketing strategies is to make sales, and call to action is what closes that sale. Well, at least in most cases. Position your call to action is within reach on different devices. People like receiving more than they give so a giveaway will provide you with an upper hand. Put some “how to,” “step by step” or “DIY” pdf download link somewhere. It’s good for the rapport. People search the web for solutions. Be clear and straight to the point, don’t be too wordy; it’s boring. If yours is a custom landing page that allows for some social proof, show your visitors some evidence that your customers are happy about your services. One importance of landing page is that it will help you know whether or not you’re on track with meeting your marketing goals. If you have a solid marketing strategy, you probably have some metrics for measuring the success of the plan. If you have a specific number of leads you are supposed to achieve every month, a landing page will help you know whether you are on track or not. When you create a landing page, say a blog landing page with an objective of converting traffic leads into customers, you will be in a position to focus on converting the traffic. In this case, the page helps you focus on your marketing efforts towards that specific goal to ensure the growth you are working for is achieved. If you are considering running a paid advert, a landing page will complement it perfectly. Say you are running an ad on Google and it’s bringing you loads of traffic; you need to make the most out of every buck by optimizing your conversion funnel; the landing page so that it becomes an efficient tool converting a large portion of that traffic into customers. If the traffic meets a static web page or a dull landing page, it’s more or less like wearing a blindfold and trying to hit the bull’s eye with a dart. With a landing page, you make your vision clear and the bull’s eye larger. A personal touch with your customers makes them feel treasured like they are your only customers. Alternatively, potential customers for that matter. Landing pages are strong lead magnets, but that’s not their single use; they are highly versatile. They give you an opportunity to develop a touch with the customer at different points of the customer journey. There are many ways of how to use landing pages to achieve this, but the most fundamental idea is to make the landing page feel like you addressing one reader.